Real Madrid captain Sergio Ramos is reportedly keen for his club to beat Barcelona to the transfer of Chelsea wing-back Marcos Alonso this summer. The Spain international is seemingly a big fan of his fellow countryman, and Don Balon also report of Barcelona’s interest in bringing him in to fill a number of different positions. 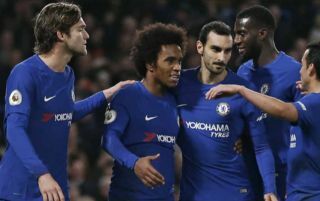 Alonso has impressed at Chelsea, playing a key part in their Premier League title victory last season and emerging as one of their more consistent performers in this otherwise disappointing season in 2017/18. It remains to be seen where the 27-year-old would fit in at the Bernabeu, with Marcelo the clear first choice at left-back in this current Los Blancos side. It would undoubtedly be a big loss for Chelsea if Alonso were to move on, but Don Balon report that Ramos has held talks with Florentino Perez recently regarding transfers. Although the club will be focused on this weekend’s Champions League final, Don Balon also suggest they are looking ahead to the summer transfer window, with Alonso in their sights.